This review is about item#9335042. If you want to make it into a flat surface, you can not dent the grindstone, so grind it accurately and quickly. However, since the sharpening trace enters deeply, it will be a bit painful with the back grinding stone to make a mirror finish. Durability is only used once, so I do not know yet. This review is about item#34756626. I could use the front and back so it was good. I thought it was a knife sticky product, but I could use it for carpenter sharpening. 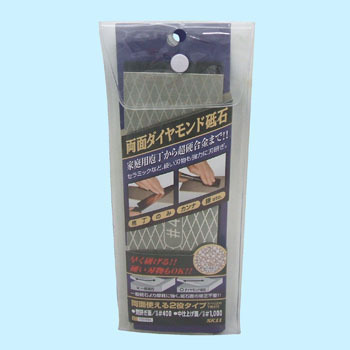 I thought that the planar treatment of the grinding stone was impossible to process if the material to be scraped was not flat, and I purchased it. Regarding this grindstone, it can be used with confidence because it remains flat even if it is used. This review is about item#09335042. The goods were satisfactory, but the price is 1980 yen in regular sales at a neighborhood home center. It is 2980 yen here. It is a feeling that coupons were deceived by food. Monotaro was credible in terms of price, but it is too bad. "GISUKE (Takagi)" I bought earlier was too bad, so I repurchased this one. It is reasonably flat and has a wide blade width. The other point is when the peeling of the diamond will come, but for now it has no problem. I long for long-lasting. It will take a long time to sharpen the outrage when the kitchen knife does not run out, but if it is this grinding wheel it is relatively easy to sharpen. Also I am happy that you can not reposition the grindstone. I was glad to use the 150/600, so I bought 400/1000 as well. I think that the original grindstone is good for finishing. Up to now we have used things of around 10,000 yen, but here also sharpen sharpening work sharply, usability is good. On the other side, it is profitable that the eyes are different.